Live streaming events featuring a Healing Bowl Concert and four classes led by Geshe Thupten Dorjee, taking place on Thursday, August 15th through Sunday, August 18th. 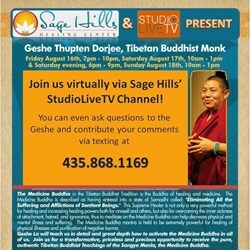 Sage Hills Healing Center and StudioLiveTV present a weekend filled with healing sounds and special teachings from Geshe Thupten Dorjee. This is a rare opportunity to experience the teachings of the Geshe. Starting Thursday, August 15th, StudioLiveTV and Sage Hills Healing Center will live stream the Crystalline Sound Healing Concert from 7-9 p.m. (MDT). Sound Healing Bowls and Gongs are used to create a relaxed, comfortable environment, conducive to deep relaxation and stress reduction. This presentation will also be available for on demand viewing. The cost for the concert is $15 for unlimited viewing until September 30th. All proceeds help fund Geshe's travel to the Healing Center. The Medicine Buddha is the Buddha of healing and medicine. Geshe will share these pure ancient Tibetan daily practices on how to work with the Medicine Buddha for self-healing and powerful opportunities for creating healing within the global human community, consciousness, and the planet. Four classes led by Geshe Thupten Dorjee will be presented on Friday August 16th (7 - 10 p.m. MDT) Saturday August 17th (10 a.m. - 1 p.m. MDT) and (6 - 9 p.m. MDT) and Sunday August 18th (10 a.m. - 1 p.m. MDT). StudioLiveTV will be live streaming these special events. The price for the full weekend (Friday through Sunday) is $108. Each single class is $25. These classes will also be available for on-demand viewing until September 30, 2013. To register for the concert and classes, follow the link. StudioLiveTV partners with fitness clubs, yoga, Pilates and other types of wellness practitioners all over the country and around the globe to help them provide a live online class venue for members and clients via a custom, branded web portal.